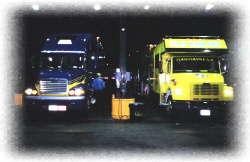 Car Wash Guys allow Blue Beacon to catch up with us at a fuel island at the Pilot Truck Stop in Fernley, Nevada. 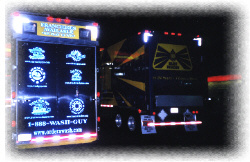 While both trucks are clean, only one glows in the dark. 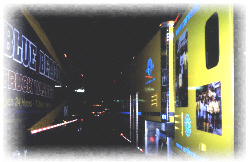 Note: Both truck are frieghtliners, but only one company can service Freightliners Corporate Head Quarters Employees in Portland. 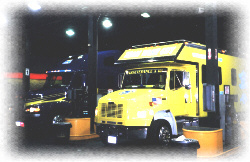 As you can see, our truck is neck and neck with the Blue Beacon truck at the fuel islands. We gave them the #1 pump island pole position. When we both departed, heading East, we never saw them again. We even waited in Salt Lake City for 2 hours, but they never showed up. One last item for comparison...Blue Beacon has a standard truck trailer with a roll-up door, while ours is a custom featherlite with a 10 foot stainless race car ramp. Who should win the best truck award? You be the judge.